FAREHAM, UK -- (MARKET WIRE) -- September 8, 2005 -- Elan Digital's new miniature PC oscilloscope, the USBScope50 is a single-channel module but when you snap two or more of the modules together you can make up to 8 channels at will. Elan's proprietary synchronisation system ensures tight Oscilloscope channel-to-channel matching and concurrent triggering. Each module is powered via its USB port. Each USBScope50 module has a BNC connector supporting any standard scope probes. The miniature PC oscilloscope delivers the ultimate combination of performance and flexibility. 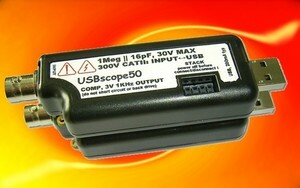 The USBScope50 is a fully isolated, professional grade test instrument which can be plugged into a laptop computer USB port and is ready to go. Features such as Modular design, small size, isolation and 75Mhz bandwidth make this device an ideal choice for applications in the automotive sector. It comes complete with a graphical software package and a demo is downloadable at http://www.elandigitalsystems.com/usb/usbscope50.php. Elan Digital plans to launch a series of miniaturised test and measurement products in the near future. Elan Digital is a specialist design house centred on interface technology. A worldwide range of clients uses their products and custom design services. Elan Digital is a privately owned company which has gained unique experience over its 28-year history and uses the latest design & manufacturing technology which makes them one of the leading PC and PDA interface design companies globally. In recent years Elan Digital has expanded its design expertise to include USB, Express Card and SD technologies and has focused its design efforts on unique products for the fast-growing mobile datacomms market. Elan Digital has ISO9001 (2000) approval.